When will the Human race change? I received an urgent email from a shelter worker (and friend) today, about a special dog they have in their care. This dog they dubbed “Papa Smurf”, has warmed the hearts of the staff members with his gentle and loving nature towards humans. 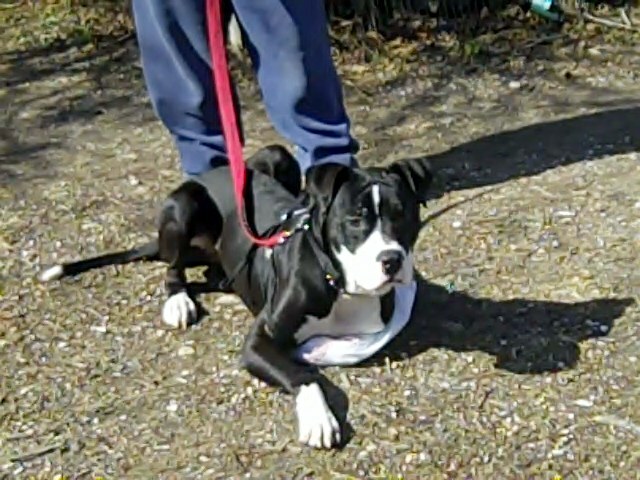 The dog is an American Staffordshire terrier or as many people frequently call them, a “Pit Bull”. You all know how I feel about that term, if you don’t by now, I hate it. To be more clear, I really (fill in the blanks) hate it and Papa Smurf is a really good example of why. 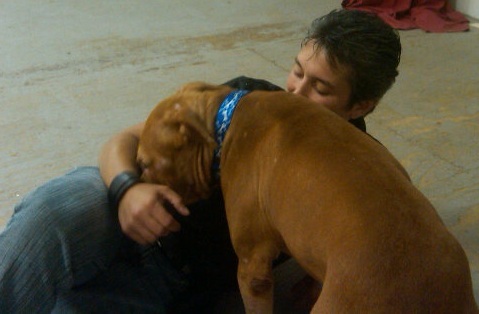 “ 9-23-10 Dog is super sweet, very good natured. He appears to be house broken. He will whine to go outside to go potty. He gets a little nervous when a lot of dogs are barking at him. He loves affection, walks great on a leash, and gives sweet kisses. 09/23/10 18:23 Met this dog in L&F today and was blown away. Even with all the medical stuff going on with him, he is super sweet. He loves people and wants to constantly be with them getting affection. Very nice dog. 9/23/10 Great dog. Very gentle. Shy, but wagging and looking for approval. Loves petting and does not appear to be at all head shy, which is surprising for dog with this type of scarring. For anyone unsure of what a “bait dog” is, I will explain. Please understand it is very heartbreaking but this happens every day and needs to be known. 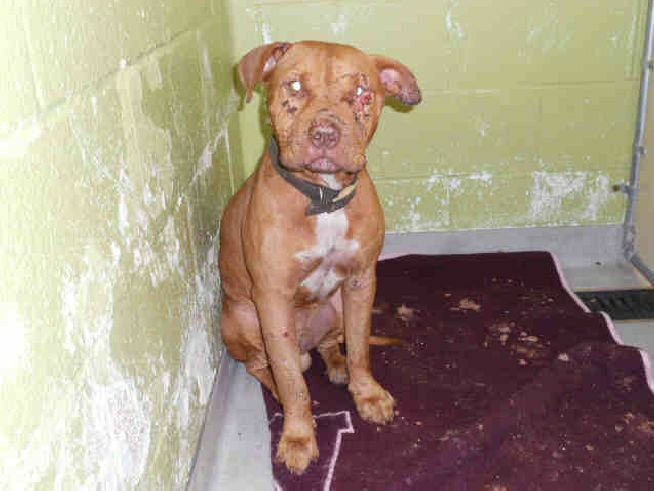 A bait dog is typically tethered to a fence or tree by a short line, about 6-12 inches( if that), so they cannot run away or possibly injure the dog they are training to “fight”. Their mouths are generally taped or wired closed (I have personally seen a dog with a metal hanger used as a muzzle), again so the dog in training does not suffer any injury. The, dare I call them, humans that are training their “fighters” will then release their dogs in an all-out attack on them. They will be cheering them on in hopes they can get them even more excited about killing their victim. The “bait dog” has no chance to run or defend itself and typically if they are not killed by the dog being trained to do such horrific damage, they meet a very cruel and horrible death. Most times, left to die from their infected wounds, or if these barbaric idiots are drunk enough, they may torture them until they do die. Now most of you have heard the horrible torture the Michael Vick’s dogs endured, this is not just media hype. This is real life and HUMANS were the cause. Sadly in Pittsburgh, street dog fighting is very common. In this, a group of young gang members will meet in an alley and have the dogs attack each other in a show of gang strength. The losing dog is typically hung, tortured, and left to die, all because it lost the fight and embarrassed the gang member that lost. Again humans are doing this, the human race that I belong to. It is embarrassing. Embarrassing to know the “more intelligent” species could do something like this and sleep at night. And yet, people all over the world will blame the breed of dog instead of looking at the true responsible party, the human. People can’t bear to think that our species would be responsible for such cruel acts. They would rather blame a creature that even after being tortured by us, will show humans warmth, love, and trust. I will admit my species is not perfect, I can admit it after seeing dogs like Papa. Papa “a dog that even after he suffered like this” has the forgiveness for other dogs and the human race. Could any of you ever forgive someone for this type of torture if it was done to you?